There is a plentitude of events that are scheduled throughout the soccer year. 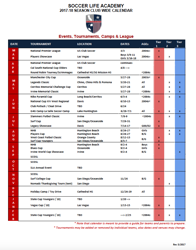 To allow families time to prepare, the Club Calendar has been created providing a schedule guide for league play, tournaments coaches are interested in attending, camps/clinics and club related events or activities. * Note: Calendar is to be used as a guide to update calendars and schedule vacations. Contact Coaches or Team Administrators to confirm attendance and events being held.